Shawn Main is a designer for Magic: The Gathering. He joined Wizards of the Coast from the Great Designer Search 2 after years of directing theater, training medical students, and playing multiplayer Magic. 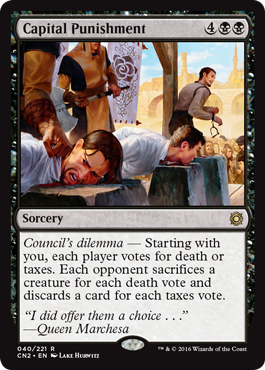 Grab the crown, stick a dagger in your friend's back, and count your votes—Conspiracy: Take the Crown previews are finally upon us! The set continues the legacy of cutthroat multiplayer action, Draft shenanigans, and twisted, twisted Fioran politics. My name is Shawn Main, lead designer of both the original Magic: The Gathering—Conspiracy and this brand-new set. I've got a treasure heap of awesome preview cards to share along with a few design stories, but let's begin with my favorite card in the set (one that's sure to find a home in many cubes) just to set the right mood. A mythic rare conspiracy. One of the two in the set. 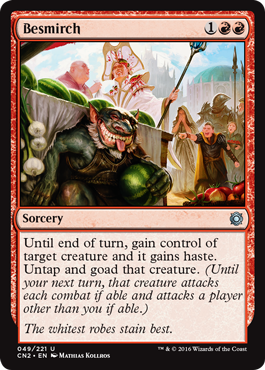 When you draft this card, it doesn't go into your deck—but it will completely reshape the game you're playing, essentially letting you turn any card in your hand into a land that produces any color. 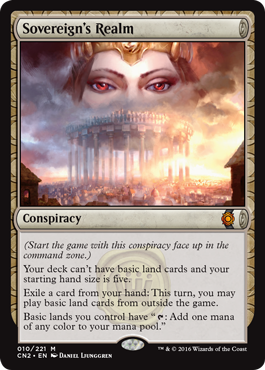 If you're curious to learn about how the conspiracy card type works, check out today's mechanics article. By all logic, Conspiracy shouldn't have ever happened. Four years ago, I was a new designer at Wizards and was pitching the idea of multiplayer drafting around the office, sharing my Planechase cube and asking if people thought it was compelling enough to inspire a product. People agreed it was fun and novel, but generally couldn't see what to do with it. Was there enough of an audience for a multiplayer-focused, drafting-focused booster release? Well, my timing was magical. There was another product scheduled for summer 2014 that was itself proving a little too logistically challenging and needed to get pushed back. Suddenly, a spot opened in the calendar and I was given a ragtag design team, intent on proving that multiplayer Magic had a dedicated audience. At the time, I was told the set was an experiment. 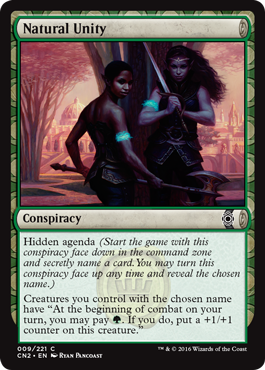 Magic sets take a long time from when design begins to when they hit shelves, so it was two years later when Conspiracy finally came out. And it proved successful. Multiplayer fans came out of the woodwork, and people who were used to having a mere one opponent tried out the set and enjoyed the insanity too. And I found myself getting asked, only a few weeks after Conspiracy's release, whether I would be willing to make a second one. And could I start right now? I said yes immediately and formed a design team, but I knew we were being handed a daunting challenge. What did Conspiracy do right? What could be improved on? And, even more critically, what were the essential elements to preserve? At that point we needed to identify what was really core to Conspiracy. Should we continue with the same setting? Would people expect more cards that influence the draft? Would they expect the same mechanics? It was such an experiment, would players want something completely unique? Where should we evolve, where should we twist, and where should we repeat the elements that worked? We brainstormed and discussed this topic in our very first design meeting. We debated the details, but three pillars emerged that were absolutely essential to Conspiracy's identity: 1) multiplayer matters, 2) drafting as mini-game, and 3) Paliano as a setting. Multiplayer was the most obvious of the pillars. Conspiracy games are built to be played as free-for-alls with three to five players. This reshapes so many things about the experience, creating a social dynamic, changing the pace of games, making players reconsider what cards and strategies will be powerful. It also makes a number of demands on how the format needs to be designed. This mechanic is different than anything we've done before, and not because there are rules that aren't explained on the card. Once someone introduces the monarchy to a game, it's a new resource to be fought over for the rest of the game, changing decisions about who to attack and when. Every color has at least one card with the mechanic, though it lives primarily in white and black. 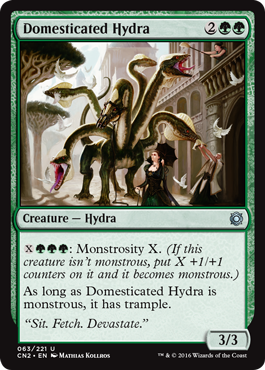 I can confidently say that this mechanic will be central to your experiences with this set. This wasn't the first mechanic we figured out in design, but I knew from the beginning that we needed something in this role. Multiplayer Magic has a problem where often the best strategy is to turtle up and let other players fight. But waiting around isn't fun, so good multiplayer design encourages players to move the game forward by rewarding aggression and action. 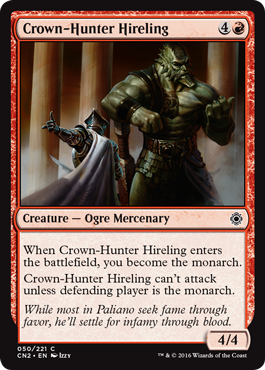 In original Conspiracy, the dethrone mechanic served that role, and I knew we needed something like that. James Hata is a designer on the Duel Masters card game, also produced by Wizards. He came up with the idea for becoming monarch while we were brainstorming splashy multiplayer mechanics. I immediately knew the idea was exactly what we needed, letting one player paint a target on their head in exchange for great power. Plus, it had built-in flavor that was perfect. There were a number of challenges, both in exactly what the reward was and in how the mechanic functioned, but importantly also that Mark Rosewater had earmarked a conceptually similar mechanic for a future set, so I needed to negotiate with him about whether my team could use the mechanical space. Well, I needed to negotiate with Rosewater and his exploratory design lead for that set, who in a twist of fate, was me. Eventually, we decided the mechanic was a home run for Conspiracy: Take the Crown. Hopefully, you'll agree. There's always a challenge when it comes to red in multiplayer. In one-on-one play, it's a perfectly viable strategy to outrace your opponent, throwing away long-term strategy and defense to end the game more rapidly. In fact, it's part of red's core identity and core gameplay as a color. That's much more challenging in multiplayer, partly because your opponents collectively have a higher life total, but also because you can't ignore defenses along the way or you'll get stomped. Goad makes up for that weakness in a very red way, forcing the game to move forward but also diverting that action toward other players (when possible—in a one-on-one game, you're still getting attacked). Melee is the Conspiracy mechanic for Spikes. Because multiplayer battlefields are usually so much more complex than one-on-one battlefields, usually we're looking for something to help you cut through that complexity, such as the monarch mechanic giving you a clear target to focus on. This mechanic does the opposite, encouraging you to consider the entire board and ask, "What would happen if I attacked everybody?" Multiplayer runs into the challenge that players who fall behind early are at risk of being eliminated, and many mechanics that encourage aggression would also encourage picking on the player in the weakest position. We didn't want that, so we were looking for mechanics that would give you the chance to spread out your attacks. Late in design, we felt like something critical was absent from the set. We didn't have voting in the file, and people were missing it. My favorite part of voting in the original Conspiracy was that it became this communal group activity. I often think about how games treat someone who's currently overwhelmed. For all my love of multiplayer Magic, I was a shy kid and would not have been assertive enough play big group games with strangers. How could the game ensure that I was participating meaningfully? Voting answered this by pausing the main action of the game to briefly shine the spotlight on each person. The only problem with voting in Conspiracy (and in real life, I suppose) was that sometimes your vote didn't matter. If everyone at the table has one opinion and you're last in line, then too bad. We solved that through a variant voting scheme (Ken Nagle had advocated for this version in the original Conspiracy) where every single vote counts. With Capital Punishment, for example, if everyone at the table wants taxes but you choose death, then good news! Creatures are still getting sacrificed. I've never considered it until now, but we basically moved from an American majority election system to a Parliamentary proportional representation system. Neat. It's important during any design to recognize how other people have already solved the problems you're dealing with. 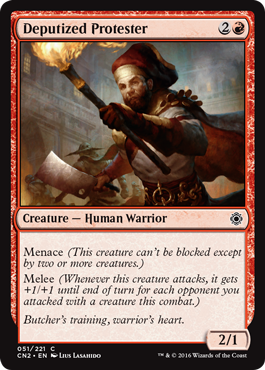 With Conspiracy, that means knowing what reprint mechanics already address our goals. Multiplayer games tend to go long, but players are at risk if they fall behind early. That means we particularly need mechanics that have play in both the early game and the late game. Fortunately, Magic already has a rich history of tools that address that very problem. Monstrous is a great mechanic, and using it here meant we got to play around with some brand-new designs both mechanically and visually. Paliano's monsters don't necessarily hide in remote places—some are taken for strolls through the central park. Every booster pack of Conspiracy: Take the Crown contains a special card identified with the crown watermark. These cards have a rarity scheme separate from the rest of the set and all modify your game in some way that relies on the fact that you're drafting. When you sit down at a table with Conspiracy boosters, expect a lot more cards to be revealed, expect to decide how your neighbors' cards are going to work, and generally think of the draft as a series of mini-games you get to play in anticipation of the real game. All these elements were present in the original Conspiracy, so what twist does Conspiracy: Take the Crown offer? Well, our answer was pretty fundamental to Magic itself. In the original Conspiracy, all the draft-matters cards were artifacts and all the conspiracies could be used by anyone. What happens when you add color? Well, for starters, you can get more powerful effects because the cards don't work for every deck. 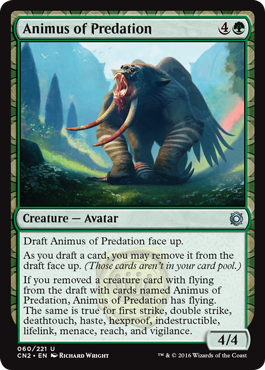 If someone opens Natural Unity, they can't immediately slam it unless they're playing green. So in a draft, it might actually get passed. The third pillar of Conspiracy is its setting. We designed the original Conspiracy as a blank slate, turning the design file over to the creative team with such evocative placeholder names as the card type "draft action." Marchesa was the only legend in that set, called Vera in the design file as a nod toward Oscar Wilde's nihilist assassin. It is a testament to the creative team that they saw exactly what Conspiracy truly was and crafted a setting that was perfect for the politics, backstabbing, and humor that the games contained. The creative team at that time also came back with characters and kindly asked if we could give them more legends in the set to serve as faces and agents of that intrigue. In contrast, when we started designing Conspiracy: Take the Crown, we had the setting and the cast in mind from day one. 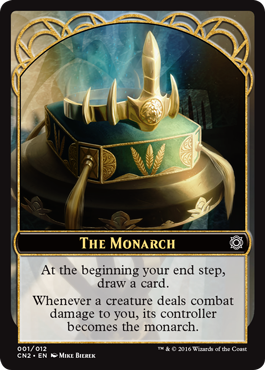 This time, we could talk about how the monarch mechanic was a reflection of Marchesa's bid for power and how the mechanics could be integrated with the different characters—"If monstrous is here, what does that mean for the city?" "Maybe Selvala is setting free all the beasts of burden." How much time has passed? Who's been assassinated? Who's been displaced? What threads did we leave hanging? And what new intrigues are afoot? The answers to these questions and more can be found in the Conspiracy: Take the Crown Story Archive, and in the set itself when it is released on August 26!